We all know how dog is man’s best friend. However when it comes to our households, dog is definitely among the most great menaces there are; and especially with reference to our carpet maintenance, rug maintenance and upholstery maintenance. No matter how hard we try to keep these very visible and quite important elements within our homes in perfect form at all times; having dog in our home definitely does not make this task any easier, just the contrary. Even though dogs are extremely loyal and devoted animals they are still animals, and like that have various urges and needs. You need to take your dog out for a walk, you need to let it run freely outside, to socialize, with other dogs, to do his/hers things, to play in the nature and so on. In so many things dogs are very similar to small children, they are carefree and they do not keep record of the last time you had your carpets professionally cleaned or when was the last time you vacuumed your upholstery or cleaned around your home. They are only animals and these things do not concern them. For those reasons if you wish to create a great relationship between your home and your pet you should make sure to establish some rules. When it comes to pets and rules this mainly refers to the pet training you should try to practice with your dog. How to preserve your carpets? 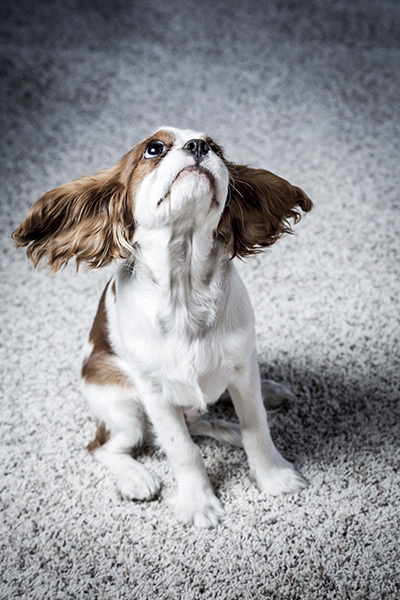 Your carpets maintenance as well as rug and upholstery maintaining routines and frequency, they all will highly depend on your efficiency to train your dog. The better the trainer you are, less you will need the assistance of the professional carpet cleaning company.